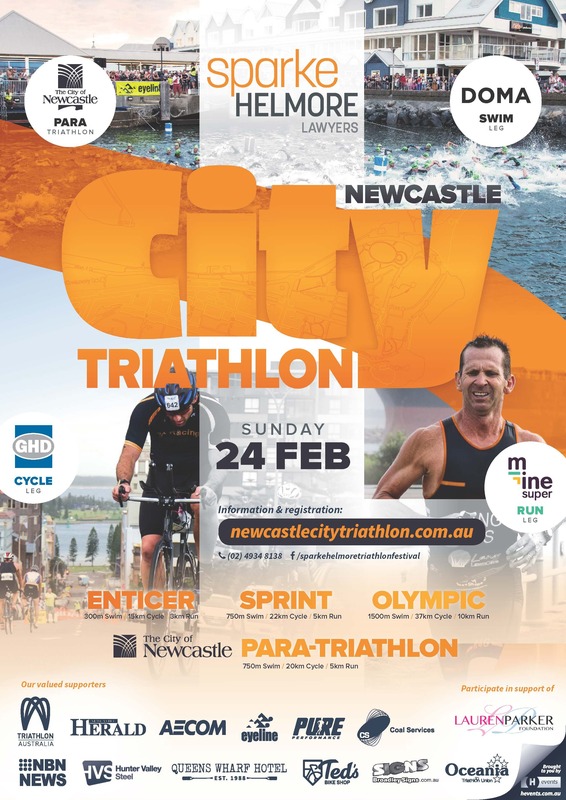 Thanks for entering this years Sparke Helmore Newcastle City Triathlon or City of Newcastle Oceania Paratriathlon Championships. In particular thanks to those local triathletes who have chosen to race local. This year we are also the Hunter Triathlon Series Championships and Final Race. So if you are keen to race for your club. Train Hard! 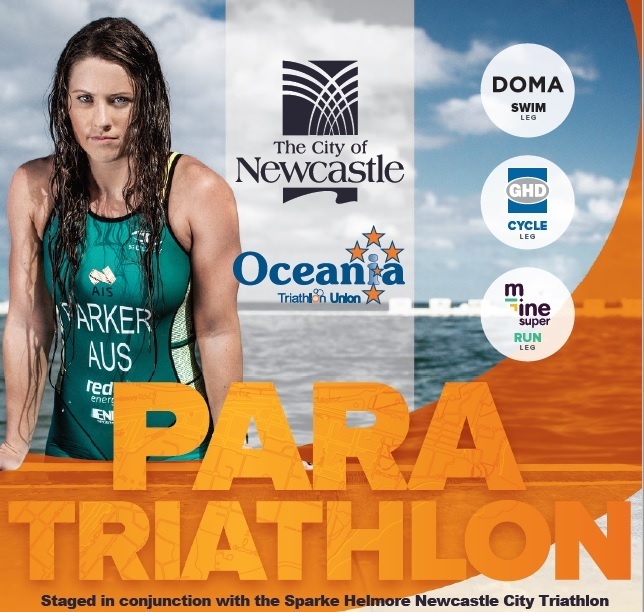 This event could not be staged without the support of our presenting sponsor Sparke Helmore Lawyers and our Leg and event sponsors Doma, GHD, Mine Super and The City of Newcastle. 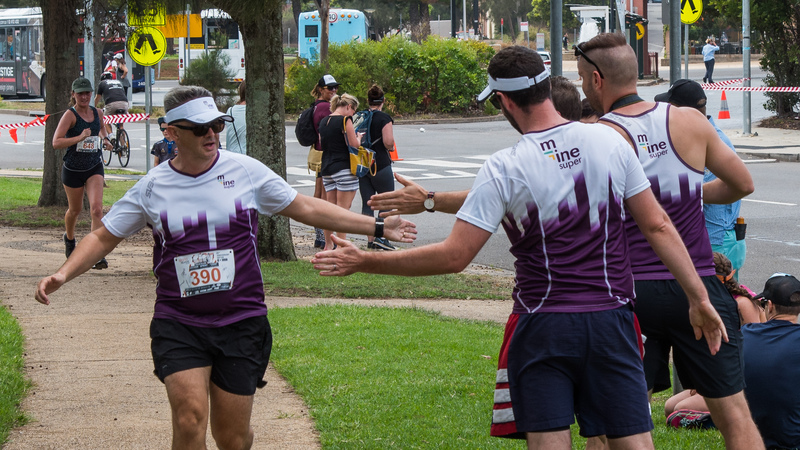 We also thank our supporting sponsors Coal Services, AECOM, Eyeline, Hunter Valley Steel, Pure Performance, Queens Wharf Hotel, Ted's Bike Shop, Broadley Signs, NBN News and The Newcastle Herald. Below is some news and tips on this years event. Please read and pass onto anyone in your team who may not receive the mail. A full race booklet will be available 7 days before the event. Standard Entries and Shirt offer closing Sunday 10 Feb - 11.59pm. Let you friends, colleagues or family know that standard entry prices will increase as above. Tell them to GET MOVING! Please send this on. Sat, 23 Feb 10-4.30pm - race kit collection, late entries, sport expo. Sun, 24 Feb 5am - race kit collection, late entries, sport expo. Note all activities are based around Queens Wharf Hotel and car park. Since a shock bike accident in April 2017 from which she sustained serious injuries including spinal cord damage, Lauren Parker has faced and overcome numerous challenges. One of these challenges has been transitioning from a successful able-bodied Triathlon career to become an elite level Paratriathlete.Amazingly, in the space of 12 months Lauren qualified for, then competed at the 2018 Gold Coast Commonwealth Games where she won the bronze medal in Paratriathlon. Only to follow this up by winning a bronze medal at the 2018 ITU World Championships, also on the Gold Coast. Lauren is now focussed on becoming World Champion in 2019 and then qualifying for the 2020 Paralympics in Japan. 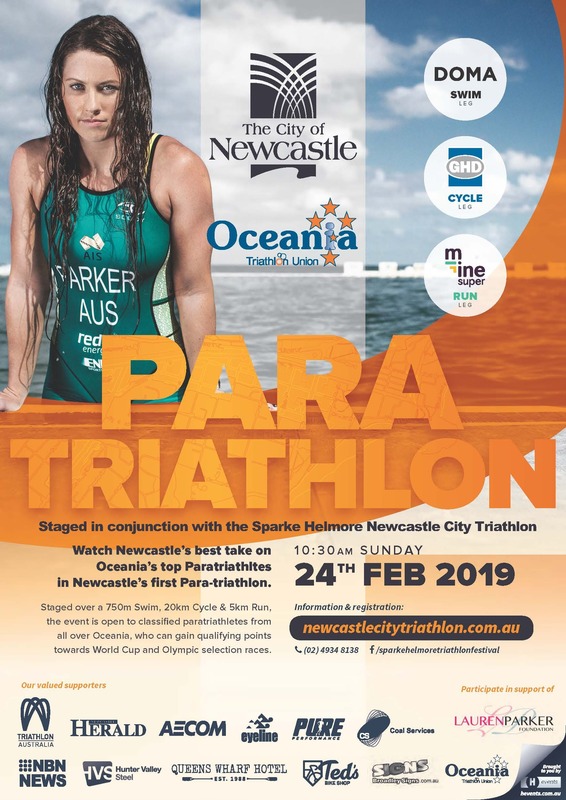 The 2019 racing season will kick off in Lauren’s home town of Newcastle, at the Sparke Helmore Triathlon where the City of Newcastle Oceania Paratriathlon Championships will be contested. Lauren had the honour of helping design the course and can’t wait to compete in front of friends and family. This year's swim leg is sponsored by DOMA. With the help of DOMA and with the inclusion of the Paratriathlon, we will use a floating pontoon and entry ramp to enter and exit the water. This is located 15m east (towards Nobbys) from the end of Queens Wharf. The pontoon will be accessed by an engineer designed ramp and exit scaffold, suitable for both triathletes and paratriathltes alike. Swimmers will start on the harbour side of the pontoon and swim east and turn to the rightand then right again and back to the exit ramp. Note the exit ramp will require you to swim onto the ramp, stand and step or climb onto the the pontoon. There will be helpers to assist. 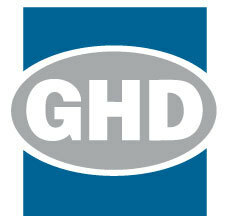 This year's Cycle Leg is sponsored by GHD. The cycle leg is one of the most picturesque Triathlon courses in Australia, traversing, the Newcastle Foreshore, Nobbys and Newcastle Beaches, South Newcastle cliffs and King Edward Park. The bike compound for the Triathlon is located in Market St Lawns and on the road in front of Queens Wharf for the Paratriathlon. There is a 150m- 270m run to the transition areas. A few points about the GDH Cycle Leg. the Olympic/Standard distance event climbs King Edward Park 5 times. The climbs total just 1.3km of a 7.75km course. The course has one other small climb both ways and is otherwise flat or downhill. It is not an easy ride, and has some technical cornering, especially at the the right hand turn from Watt St to Shortland Espl/Church. There are also some raised speed humps along the course. Please pay attention to your speed and grip when approaching these. the Sprint Distance event climbs King Edward Park just three times on the same course. the Enticer Distance will be extended slightly to match the paratriathlon course, but we will drop one lap to make it 3 laps. The total distance will be 14km. There are three smallish climbs on each lap. The turn point is close to the South Newcastle access Rd. the Paratriathlon course will use the same course, however to make their distance exactly correct the Paratriathlon (only) will enter Pasha Way at Nobbys on the way out and back. This will be well marked and directed, however will be technical at the Pasha Way out and back. You must have a roadworthy bike and approved correctly fitted helmet They could save your life! the mount and dismount lines for your event will change as the races progress. 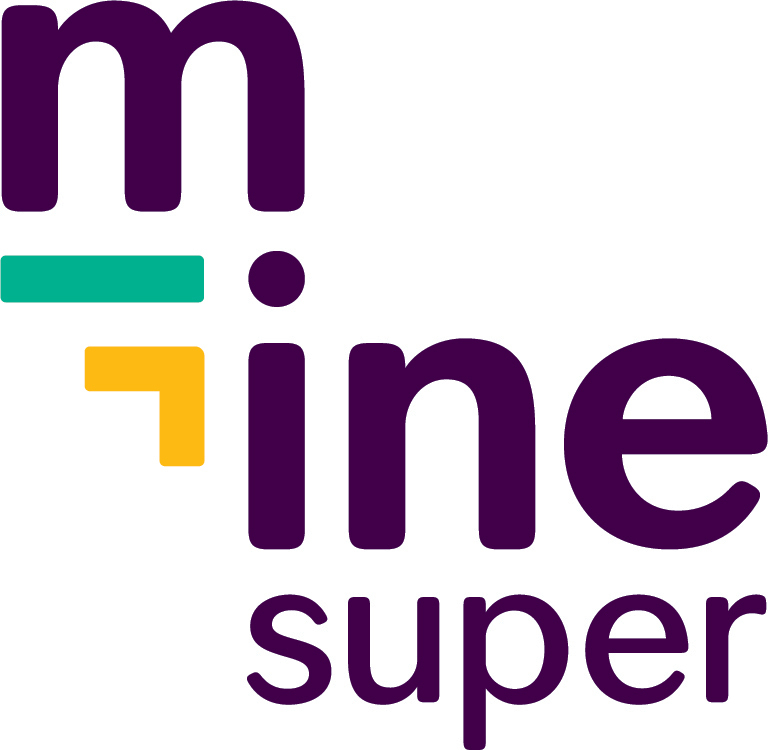 This year's Run Leg is sponsored by Mine Super. The run leg is also one of the most picturesque Triathlon courses in Australia, traversing, the Newcastle Foreshore, Nobbys and Macquarie Pier (Nobbys Break-wall). It is completely flat! Runners will exit the transition area on the western end of their compound and cross Wharf Rd to a chute where they will run east towards the swim exit and finish area. They will turn left at the eastern end of Queens Wharf Hotel and then right to follow the chute to run parallel with the harbour and foreshore paths that lead towards Nobbys Beach. Past the Ferry pilot station runners will turn left into a chute that heads around the back of Camp Shortland and enters the break-wall to a turn point and then returns on the same course until the park opposite the old bus layover area. Runners will be directed left into the park paths that bring them back to a turn point next to the finish chute. They turn right and complete the correct amount of laps. After the final lap they will enter the finish line. There is a drink station every 2.5km. Can I wear a wetsuit? - Yes if the water temp is under 24 degrees celsius. The water is 23 at the moment. Do i have to wear a swim cap in the swim? - Yes, it is a safety requirement. What sort of bike do i need? - any roadworthy bike and an Australian Standard helmet. Can one person pick up the team kits?- Yes, if all team members have signed or agreed to the race waiver. Available HERE or on race day. Were can i park? - There is plenty of paid parking in Argyle St and Bolton St parking stations and the Honeysuckle. The tram will be working from Wickham interchange. Bikes not allowed on the tram. Just ride them! Where do team members meet to change over? - Cyclists and Runners wait in the bike compound. You will be instructed were on race day. You must change over the timing chip. Can i wear shoes from the swim to the bike compound? - Yes just leave some thongs or old joggers at the swim exit (out of the way of other swimmers). Can we bring a team tent to the event? Yes, team marquees are available for hire or you can bring your own. Contact [email protected] for more information. Check out last years wrap up video. More updates soon!